The Best Walls Are No Walls! This perspective thing is still a struggle. Specifically the walls. I’m fairly confident I can put together a single room and have it look all right but multiple rooms on the screen at once is where it all breaks down. I don’t want a black screen to load into a new room every 10 seconds but I also want the game to look nice. Having walls disappear and reappear or go transparent just doesn’t look right in this perspective. 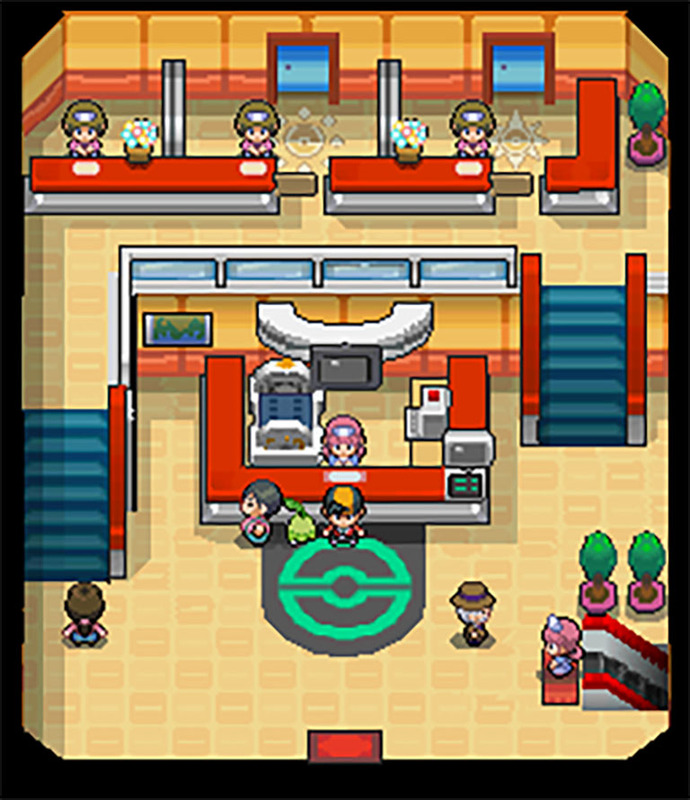 I experimented with a Pokemon Center. The original from the game. It almost worked, right? Sorta? It was a semi successful experiment because the little character can walk around the room (in theory, it’s just photoshop) and mostly look in scale anywhere. I made the desk too short which makes him look huge behind the counter. The stairs are broken because none of the collisions are at the angle my game operates at (although that may change… more experiments coming). No overlap in walking paths. Success. The perspectives really collide at the top middle there. Fail. The further you walk upstairs the smaller the room would get. It’s a normal function but too hard to ignore. For all the bad points though of the pokemon center it was still proof that I was on the right track. I decided to move onto a more complex room. 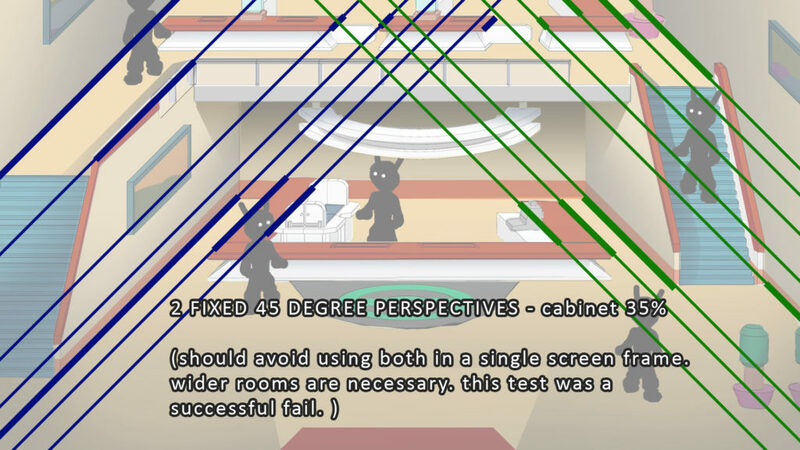 I stuck with another top-down 2D game because they make perfect blueprints. The Stardew Valley Seed Shop (Pierre’s Store). A bit of a mid-development look at my process. 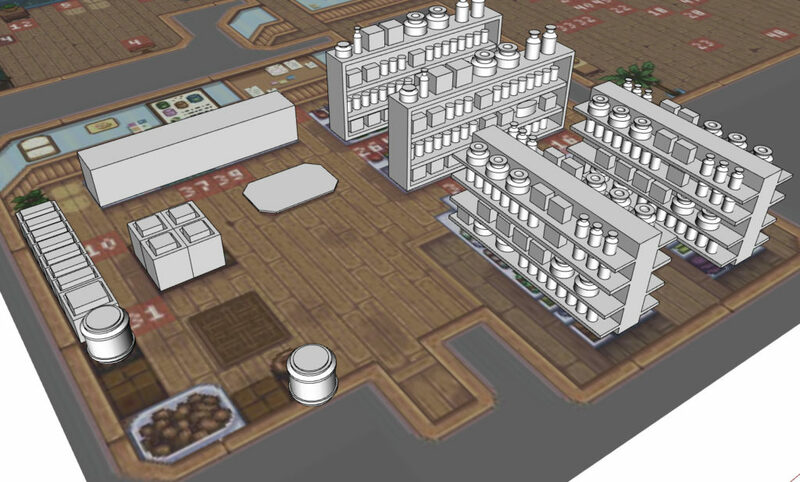 I model everything in 3D using Sketchup (as described in a previous blog post) and then convert it to my perspective (A side: 0 degree angle and 1 scale. B side: 45 degree angle and 0.35 scale). The experiments went so badly that I gave up very early. Making the racks of groceries go clear was passable. But making the entire shop go clear as the character moved into the back room was the worst. I should have saved the experiment images but they wouldn’t make sense to anyone but me. Last night, though, I had a Eureka moment. No more walls! I took a page from the Earthbound way of doing it. 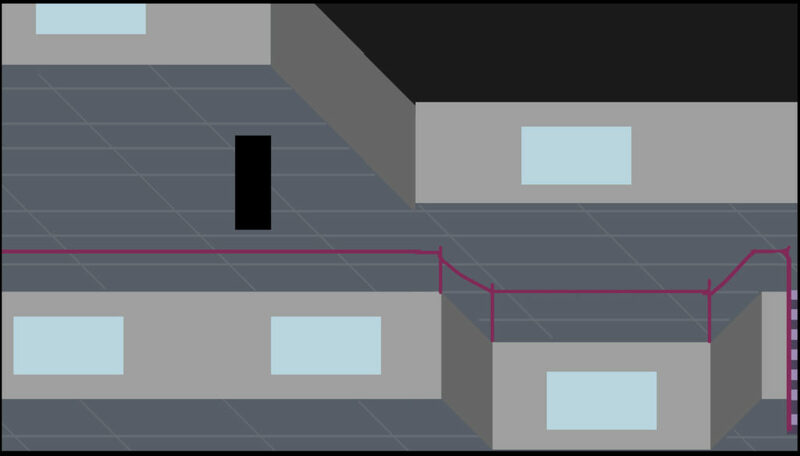 Buildings are mostly laid out from left to right so there’s never a back room but there’s the option of large layouts in a single level. And I expanded it a little. Using skinny walking areas I can make hallways and then open them up again for multiple rooms. And even better I figured out a way to make more space up and down (front to back)! Stairs! I’ll have to be very specific with the way I design interior spaces and my game will have an unusual amount of balcony flooring but at least I have options. I know it’s hard to look at. It doesn’t look like much but this image is a big deal. 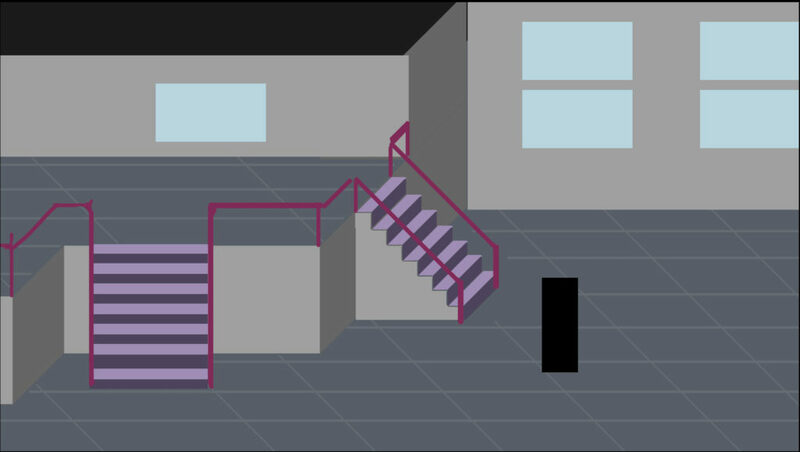 I have 2 options for stairs and both work with the collision system I created. Keep in mind that the game will be much closer to the character (black bar there). I know that so far everything has been flat and bland and abstract but I needed to learn what works and what doesn’t work before I could program this into the game. It’s likely I haven’t thought of everything yet (or even close to everything) but I’m going to move forward. I, at least, want to develop a concept art that looks closer to a screenshot of the finished game. Not only to show people what I’m talking about but to make sure what I picture in my head looks as good as I think.